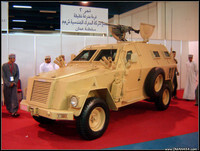 Pictures from the 2006 Motorshow in Oman, held at the Oman Exhibition Center. Last changed on 01/25/17. This album contains 3 items. This album has been viewed 2508 times since 09/25/06. 4 Monster Jeeps and 2 days of fun! 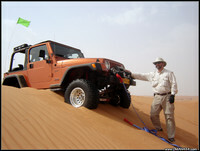 Stayed in the Sharqiya Sands hotel and crossed a few large dunes heading from West to East. Temperature was 44�C in the shade and 63�C in the sun. Only had the tow-rope out once! Last changed on 08/24/12. This album contains 29 items. This album has been viewed 6073 times since 09/23/06. Went out to the Barkha sand dunes on Thursday - a change from the usual Bausher dunes. Over 15 cars and as many Quadbikes... The large bowls in Barkha were a bit of a challenge, but the Jeeps did well! Last changed on 01/09/17. This album contains 11 items. This album has been viewed 4585 times since 09/07/06. Desert Thunder Oman Adventures wanted some action photos of their new Landcruisers to put into their brochures and website, so I was asked to drive the Landcruiser around in the dunes. The pictures were taken by Abdullah, and they came out great! Finally an opportunity for me to be infront of the camera! Last changed on 12/27/16. This album contains 33 items. This album has been viewed 4944 times since 09/04/06. 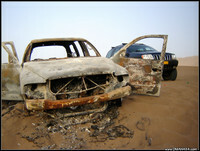 Playing in Bausher... pictures of the burnt Durango, a Subaru Impreza in the dunes, and a bit of rocky fun with the Jeeps, and a creative way to change a tire by deliberately getting stuck. Last changed on 07/16/14. This album contains 16 items. This album has been viewed 3523 times since 08/17/06.